When contemplating the prospect of building a new deck, you can think about it as adding a new space to your home. Just like when designing a new room, you should consider how you want to use your new deck and the functions you want it to serve. You may want your deck to be an extension of your indoor space, or you may want it to blend seamlessly with the outdoors. 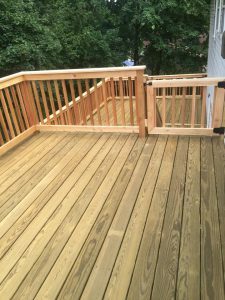 A deck builder can help you plan your deck to best use the space that you have. The first step is to make a plan for the size and shape of the deck. You need a copy of your plot or site survey to check where your property lines are. If you do not already have a copy from when you bought your house, you can apply to get one from your local zoning department. A site plan also needs to take into account any easement or setback requirements that your locality has in place. When planning for the size of a new deck it can be hard to visualize what measurements on paper look like in real life. One trick to help you get a better picture of what your deck might look like is to mark out the space in your yard using a water hose. A professional deck builder often provides a rendering of the design which can also help you to see how the shape and size of the deck looks with your house overall. In addition to the function and size, you need to make sure that details of the deck do not interfere with the design of your house as it is. Stairways, steps, railings, and posts must be placed in ways that are structurally sound and make sense for the design. With the help of a deck builder, you can achieve your dream of adding a beautiful deck to your home that will meet your needs.